Professional Webcasting and Video Production. Video Conversion & Transfer Solutions. Depending on the source of light used to light a scene, every image has a color tint either on the reddish or blueish spectrum, called the color temperature. 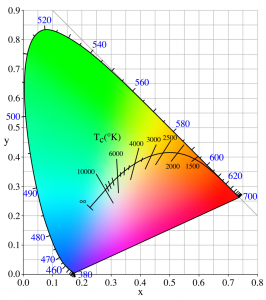 The color temperature of different light sources is measured using a scientific temperature scale called the Kelvin scale. A scene lit with natural, outdoor light, for example, will have a blue color temperature and that natural light has a high range of 5,200 to 12,000 degrees Kelvin, but will average 5,600 degrees Kelvin. A scene lit with incandescent lights will have a yellow or orange color temperature and those lights will have a low range of 2,800 to 3,400 degrees Kelvin, usually averaging 3,200 degrees Kelvin. While the human eye automatically adjusts in different light to see perceive white objects as white, videocameras must be adjusted in different light by setting the white balance. Proper adjustment of white balance will create images with accurate color ranges. Neglecting to set the white balance while shooting in different lighting conditions (moving from an indoor to an outdoor scene, for example) may result in an image appearing too blue or too red.